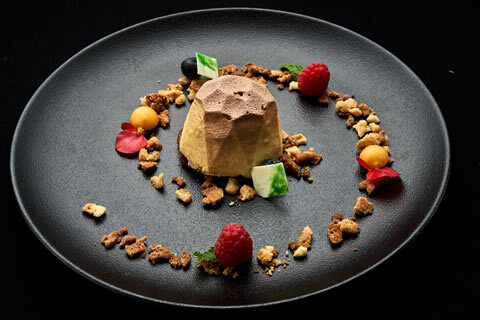 Nowadays Il Saturnino seeks to be a place where you can experience the island of Ischia, starting with historical dishes that have been reconceived with a modern touch and a strict respect for seasonality. Our finest selection of fresh marinated local raw fish dishes seasoned with herbs, seasoning and various kinds of vegetables (e.g. 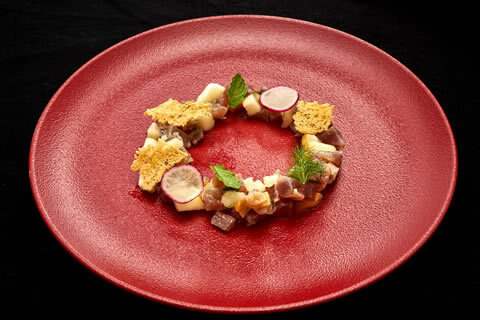 white cabbage, radish, tartare with ginger, etc.). 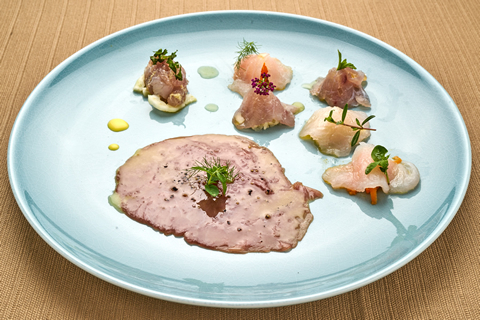 Bluefish smoked by us with seasonal fruit for a gentle agro-dolce contrast. In summer, for example, we use cantaloupe melon, white melon and green apple. Light and natural course. 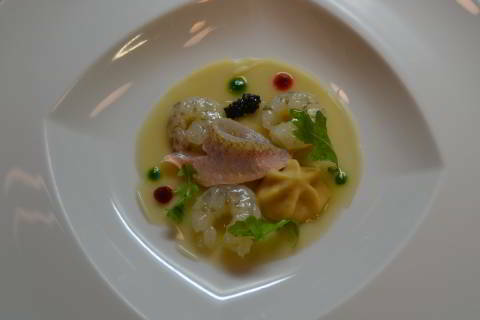 Enjoy the simplicity of marinated red mullet heads and shrimps served on a base of high-quality extra virgim olive oil with a mousse of shrimps. A simple dish enjoyed by all. 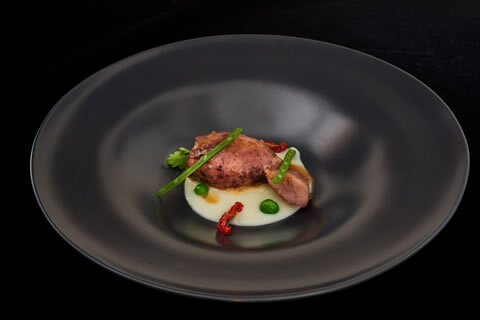 Served cold, the octopus and cuttlefish are first of all cooked and then seasoned with raw or lightly cooked vegetables (carrots, fennel, green chilli peppers, herbs, broad beans, peas, etc.). 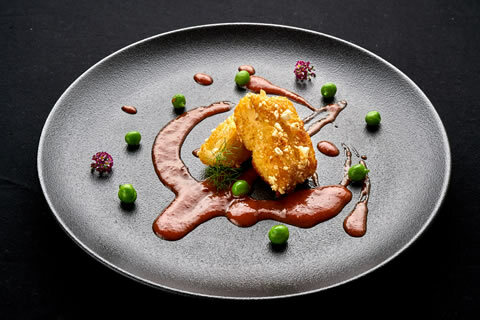 Cod is transformed into tasty golden morsels with a breadcrumb-free coating made with puffed rice, corn flour and blended with fried potato. A gluten-free dish. 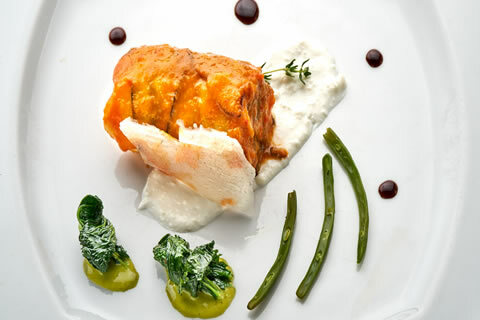 A freshly-caught fish with the typical appearance of a fish, known as “crow’s nest” or “longline”, rolled and accompanied by its own eggs and marinated red cabbage. Handmade fresh pasta stuffed with poached octopus cooked in reduced cherry tomato sauce. 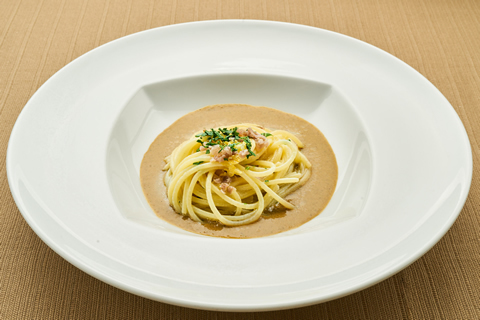 Spaghetti with mussel cream. This dish is enriched by lupin beans, which can be replaced, when necessary, by clams or strips of fish, while the base remains unchanged. 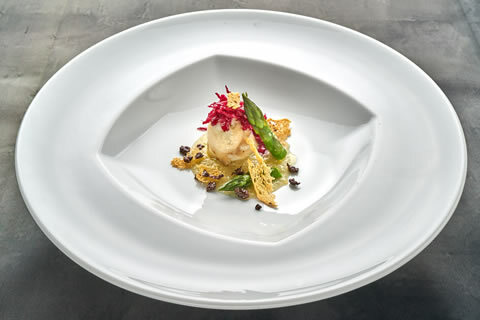 A very delicate and sophisticated flavor, exalted by the intense taste of Jerusalem artichokes. A classic dish from Campania’s marine tradition, reconceived by our chef. 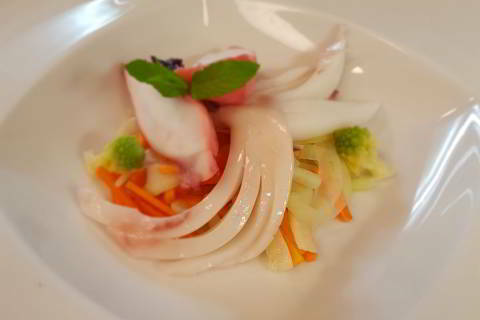 Instead of being sliced, the squid and potatoes are served with the squid’s side and head kept whole. 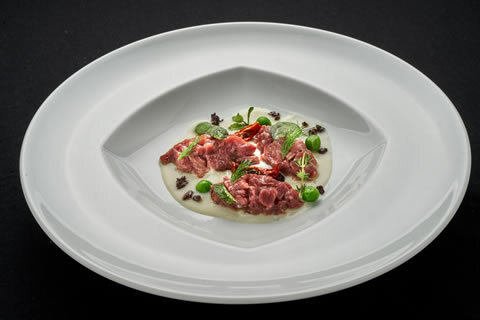 This dish can be served as a warm starter or on its own as a main course. 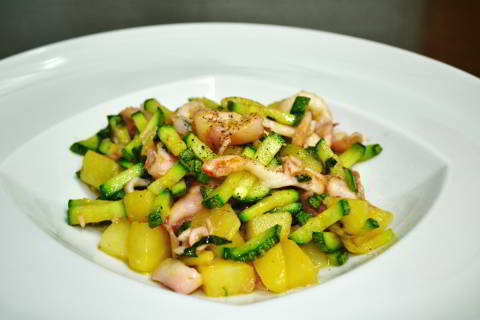 Its secret lies in the mixture of different elements: the freshness of the calamari, seasonal zucchini and the quality of the potatoes we use (floury and compact). A fresh, low fat, medium-protein white fish (sea bass, sea bream, and white bream) is served by wrapped in grilled aubergines filled with zucchini and lacquered with roasted pepper cream. A review of classic tiramisu in a full-bodied, creamy soft served version. The sweetness of tiramisu is exalted by contrast with a bitter heart of coffee. 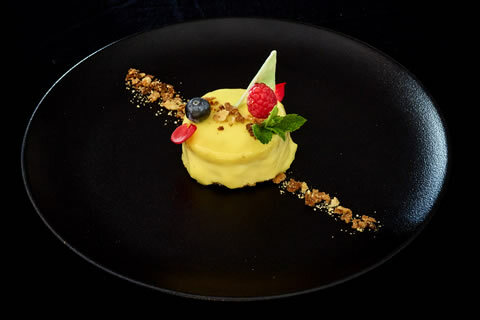 Take the Lemon delight, a recipe from Campania, first created by a pastry chef on the coast of Sorrento in the late 1970s, and leave our chef to reinterpret it; the result is a truly unique dessert.